Developing your own black-and-white film isn’t especially difficult, but it can be tricky to get the hang of the whole process — especially when problems don’t reveal themselves until the very end. Many of the questions that get asked on photography forums relate to troubleshooting the development process. Here, as a community service, are some of the most commonly asked troubleshooting questions. Q: My film came out blank (clear). Why? A: It depends on what you mean by blank. Look for edge markings (frame numbers, the film type, etc.) along the sides of the film. They are a good diagnostic tool, as they are ‘stamped’ at the time of manufacturer. Are the edge markings visible? Yes, the edge markings are visible, but the film is otherwise clear. This means that an unexposed roll of film has been developed. Either you developed an unused roll of film, you loaded your camera incorrectly and the film did not get exposed. Another (unlikely) possibility is that shutter or aperture problems led to massive underexposure. Q: My developed film looks milky. Why? A: Milky film results from insufficient fixing. Your fixer is either past its capacity or is too dilute, or your fixing time was too short. Keep the film in the dark and re-fix with fresh fixer as soon as you can — all will turn out OK.
Q: My developed film has a blue or purple tint to it. Why? Q: When I poured the developer out of my tank, it was bright pink / purple / blue. Why? A: Manufacturers routinely add dyes to the emulsion or film base to inhibit fogging and “halation” (cloudiness around image highlights caused by light bouncing around between the surfaces of the film). With some types of film (usually medium-format) these dyes wash out during development, resulting in strongly coloured developers. The colour you get will depend on the actual film-developer combination. Some films — notably TMAX — develop to give purple-tinted negatives. As long as your film is properly developed and washed, this isn’t harmful, but the tint can usually be minimized with extended fixing and washing. A few brands of medium-format film from Eastern European suppliers have permanently tinted (usually blue) film bases. No amount of washing will get rid of this tint. Was this article helpful to you? If so, let me know in the comments below. Posted as-is from a drugstore scan (1500×1000 pixels) of cross-processed Ektachrome GX film. The scans were mostly blown out, but I liked the look. 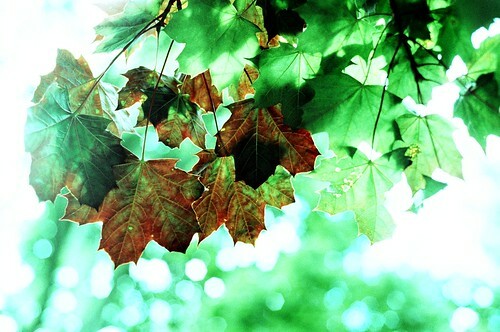 They say that Kodak film works “best” at cross-processing. I have a lot of 120-format Provia lying around, so it might be time to test that hypothesis. I shot this at a local park with the good ol’ Nikon F90 and 50mm f/1.8 lens. For all you Torontonians — I bought the film (expired 2006) for $1 at a camera fair last year, and had it developed and scanned at the Shoppers Drug Mart at Eglinton and Chaplin for $3. Talk about a cheap thrill!